e-Tender for empanelment for rate contracts of agencies/ firms for providing HR/ personnel and related services for Biswa Bangla Showrooms and Warehouse. Kindly visit https://wbtenders.gov.in to submit your bids. 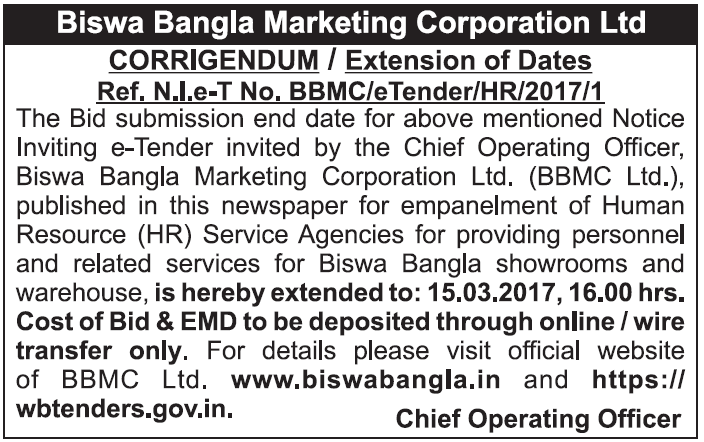 The last date for submission of e-Tender for empanelment for rate contracts of agencies/ firms for providing HR/ personnel and related services for Biswa Bangla Showrooms and Warehouse, has been extended to 15.03.2017, 16:00 Hours IST.